Kangaroos in my blood… from poem to book to art exhibition. Launching November 1, 2016, I have to admit that I am dearly looking forward to holding Kangaroos in my blood and other poems in my hand. I have been writing for as long as I can remember, and publishing poetry (in things other than the school magazine) for around 20 years, so the term ‘debut collection’ seems vaguely ridiculous. Kangaroos is being published by Douglas and Brown, branching out from their normal education and leadership list. But although it may have been a long time coming, the timing is hardly random; the book will be launched the week before the opening of the art exhibition based on its central poem at the New England Regional Art Museum. A diverse group of artists including painters, sculptors and printmakers has used the poetic sequence “Kangaroos in my blood” as the springboard for new works, and I have also been busy creating etchings, sculpture and other pieces of my own, re-visiting the narrative and themes with new skills and ideas. “Kangaroos in my blood” opens at NERAM on November 11. So November is shaping up as a thrilling month for me and I couldn’t be more excited. Now available online through Douglas and Brown at https://douglasandbrown.com/store/ and http://www.lizziehornecreative.com/books-by-lizzie-horne or Reader’s Companion bookstore, Armidale. Also available soon at the New England Regional Art Museum. 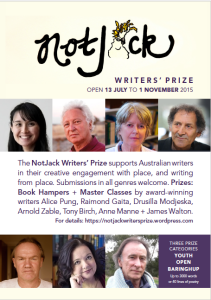 notJack is a writing competition offering one of the most generous and potentially life-changing prizes a writer seeking continuous improvement could hope for – not money, but the time and expertise of some of the Australian literary community’s elite. A prize that supports Australian writing about place and the protection of iconic literary landscapes, this is one competition that is not about glory, but power – the power of writing to engender passion about the land, about community, about the things that matter to us, to share our love of our own streets and landscapes and the soil that nurtures us. It is also about the power of a group of writers to shed a spotlight on a heartbreaking threat to a particular community, and raise money to fight it. Prizes: Master classes in writing with experienced, well-known writers including Drusilla Modjeska, Arnold Zable and Raimond Gaita. Open to all genres of writing in Youth and Open categories, all related to writing about place. 3,000 words for prose, 40 lines for poems. Must be unpublished, not have won a prize nor have been submitted elsewhere. Despite dire news in the Australian arts arena, and the folding of some highly regarded poetry prizes, there are still some opportunities for poets. Here is some information on a few poetry comps closing soon. Please check details with competition organisers, as this site can bear no responsibility for incorrect entries. PLEASE don’t send your entries to me! For unpublished crime poetry to 60 lines, crime fiction up to 2,500 words and crime non-fiction up to 2,500 words. Prizes: 1st $1500, 2nd $500, 3rd $200 plus minor prizes for Highly Commended and Commended. An anthology will be compiled of winners and selected entries. For an unpublished poem to 50 lines. Entry fee: $AU10 for one poem, $AU20 for two poems, $AU25 for three poems, and $AU6 for each additional poem. Heads up on a couple of poetry comps closing soon. Please check details with competition organisers, as this site can bear no responsibility for incorrect entries. Prizes: First prize: $500, a 3 day pass to the Byron Bay Writers Festival , publication in the Dangerously Poetic anthology and an invitation to read at an offsite Festival event. Second prize: $100, a 1 day pass to the Byron Bay Writers Festival , publication in the Dangerously Poetic anthology and an invitation to read at an offsite Festival event. For a poem of up to 40 lines on the theme of Change. Entry fee: $15 for first poem. $5 for each additional. For an original, unpublished poem to 50 lines. Prizes: 1st prize $15,000, 2nd $5,000. There will also be four shortlisted poems. For an unpublished poem up to 50 lines with a maximum of 1,000 words. Prizes: First: $12,000 Second: $5,000 Third: $1,000 Local Award: $500Harri Jones Memorial Prize (for a poet under 35 years): $250 Hunter Writers Centre members’ award: $200. The shortlist of poems will be published in the annual anthology. Please check details with competition organisers, as this site bears no responsibility for late or incorrect entries! For information on poetry competitions year-round, go to Australian Poetry Competitions 2014. If a close date for the current year has not yet been set, the competition will not be listed. This site welcomes information from comp organisers. Please report any broken links. Thank you. Prizes: $500 first prize in 3 categories plus $300 New England award for a resident of New England and $200 Emerging Author award for an unpublished writer from anywhere in Australia. Prizes: $700 in cash plus other prizes for selected awards. Top ranking and selected poems published by WA Poets Inc in the anthology “Poetry d’Amour 2015”. Winners in the Open and Regional categories will have the opportunity to perform their winning entry on Valentine’s Day, Saturday 14 February 2015 in Perth and/or Mandurah. For: orgininal, unpublished love poems to 40 lines. Prizes: 1st $150; 2nd $50. For an original, unpublished poem no more than 60 lines. Entry fee: $5 per poem. Post entries to: FAW Tasmania Inc. PO Box 234, North Hobart, Tasmania 7002.